In 2005, just after my college graduation ceremony, I frantically began packing my suitcase so that the next morning I could fly to Dallas, Miami, and finally Buenos Aires, Argentina. It's likely that my family, though they have never said as much, thought I was completely insane for leaving so soon after my graduation. The more "normal" step would have been to move out of my off-campus apartment and celebrate with friends and family for a few days before enjoying my last free summer before entering real life with a real job. Instead, I spent the majority of the following day listening to a man talk about his dog, Booger, before finally making it to Argentina where I would spend the next two weeks with Brad. We would eat good food. We would dance the tango. That was eight years ago and I still think back to that trip and get butterflies in my stomach. I was introduced to chimichurri, (which I make frequently to this day) and alfajores, which I had honestly forgotten about until a recent trip to an Argentine food truck at the Golden, CO farmers market. Crisp cookies sandwich rich dulce de leche, creating a beautiful contrast of textures that pair perfectly with a hot cup of strong coffee. When I took my first bite of these cookies, I was transported back to those two weeks in Argentina. It made me ache to return and experience it all again. Until that happens, at least I have this recipe to help me imagine I'm sitting at a café, sipping on café con crema, and looking over at the man I knew, without a doubt, I would spend the rest of my life with. Whisk the cornstarch, flour, and baking powder together in a medium bowl. Beat the sugar and butter together in a stand mixer with the paddle attachment until pale and fluffy. Add cognac and zest and beat to combine. Add the egg yolks one at a time, fully incorporating each one before adding the next. Gradually add the dry ingredients and beat until just combined. Do not over mix! Turn the dough onto a lightly floured surface and gather it into a ball, kneading it gently so the dough comes together. Form the dough into a log 10 inches long and 1 1/2 inches in diameter. Wrap the dough in plastic wrap and chill for half an hour. Unwrap the chilled dough and use a sharp knife to cut it into 1/4 inch rounds. Place the rounds on two baking sheets lined with parchment paper. Bake 12-15 minutes until the cookies are a pale golden color. Transfer the cookies to a cooling rack and allow the cookies to cool completely. 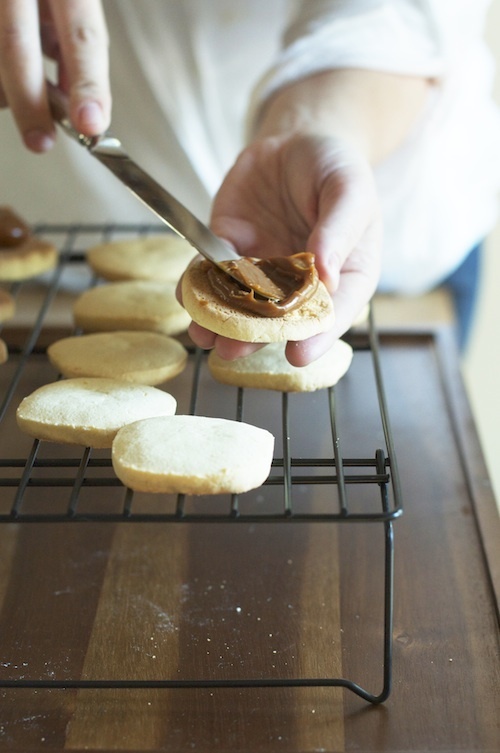 Scoop one teaspoon of dulce de leche onto the bottom of one cookie. 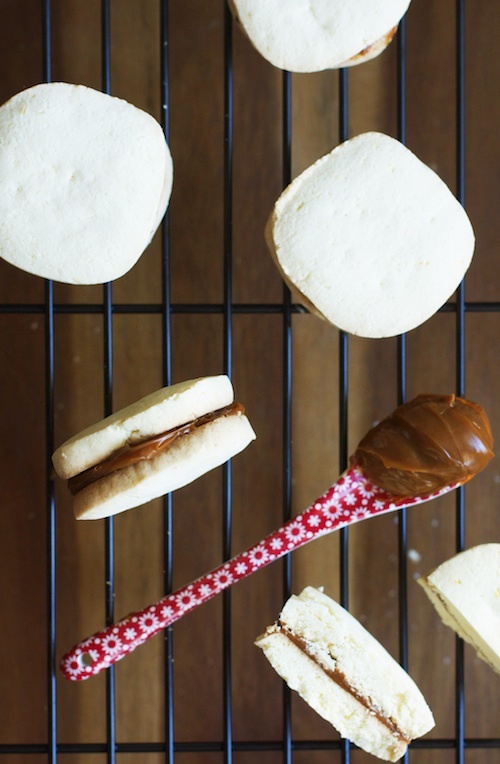 Sandwich the dulce de leche with another cookie. Repeat with the remaining cookies.